Carla Klein’s oil paintings originate from several travels that Klein made throughout the years, in this case a road trip through the southern state of Texas (United States), adjacent to Mexico. Driving around, she photographed the desolate scenery. This way of taking photos yields images full of movement, which back in her studio in Rotterdam she has made returning in her paintings. Carla Klein is balancing on a thin line between figuration and abstraction in her paintings. Some of the paintings show the emptiness of the Texan landscape, which works at the same time alienating and very attractive. 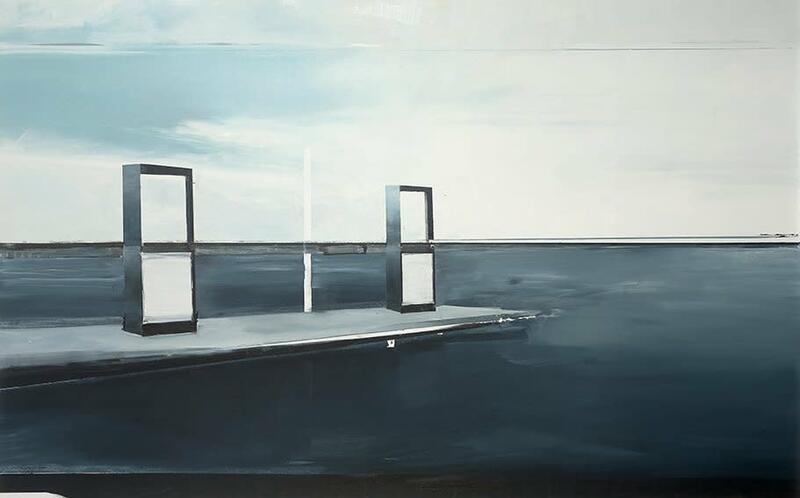 By using the emptiness as a subject Klein renders a complex look on the idea of conveying reality. The fact that she paints from photos and prints instead of from reality, adds greatly thereto. In addition, it seems in her paintings as if there are two worlds next to each other. Not only the landscape is depicted but also the space in the car is - sometimes unnoticeable - present. By photographing from within the car, the car window separates the inside world from the outside world, as subtly depicted by Klein. Carla Klein uses both analogue and digital photography. By using digital photography she grants herself much leeway, both in regard to the decisive moment of making the photo and in regard to selecting the photos for her paintings. The overwhelming nature, emphasized by a low horizon and large skies, with here and there fragments of human interventions – a piece of highway, a traffic sign – make one reminiscent of the 17th century Dutch landscape painters. By choosing the landscape as a subject she places herself in a deeply rooted art-historical tradition. But Carla Klein’s landscapes represent more than just the landscape. By focusing on, normally speaking, unimportant details for us, they yield a change in the point of departure of classical painting. Klein is painting about the trip instead of about the destination. The journey is the objective in itself. The photographs remain as the documentation of reality.